I think the rear curtains are very cool. They go a long way towards making these cars much more imposing and sinister. But expensive! Where is Floyd? His name is all over this thread, lol. He got me hooked on the idea of Venetian blinds! These curtains would look incredible, and really bolster that Mercedes feel. It looks like the lower curtain track on the rear doors is length-dependent as to whether it's an SE (0mm) or SEL (+110mm). I can't find MB part numbers in EPC - anybody know that also, please? The ones on German Ebay don't seem to specify if for SE or SEL. Maybe they're all SEL and you trim off for SE? Would want to know before buying at that price! I would really like a set. The datacard for mine says that they were fitted but I can't see any evidence of it. I will have to live without them at that price. All these years, the Frenchies were really the only ones offering complete sets, and always way above my pay grade. I just had a chance to have a look at an old rear door set, still on a wrecked W116 here, and the rear door ones look really quite simple. Rails and curtains, no complications. There must be aftermarket somewhere.. The trick is to get a lovely set that matches the interior of your car, and to not pay a fortune. I have not cracked this one thus far. It's up there with the Frenzel. It may never happen. Regarding the standard size of such a set, there isn't one. You either buy SE or SEL. Did you get any pics of how the rails fit together or attach? I would love a set but more fun if I could build a simple but quality set. no, I haven t any, sorry. Th wreck I spoke of is on the other side of the country, so that s out as well. You d have to google it. Sure it's out there. So: are you sure the curtains are original parts? 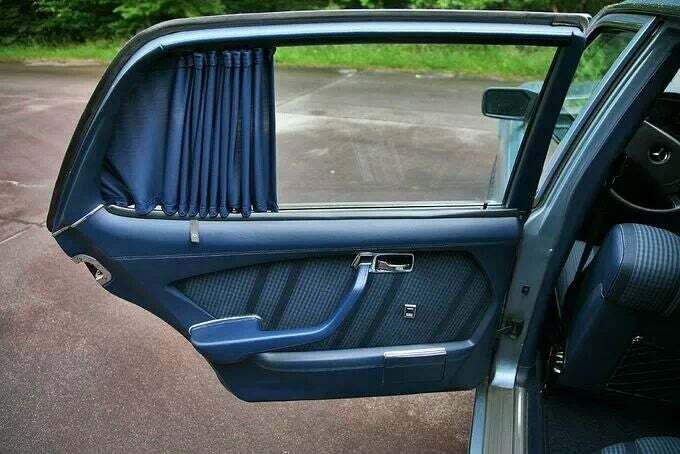 - Have a look at the screw sets of these curtains for the w126 - all i can see are modern mounting parts. - "VORHÄNG SATZ"? This is a bad german text, so this tag was never produced by Mercedes. Do you really think all their "NEW" burlwood mercedes parts are really new? similarities can be seen in many of their auctions. And yes - they are also selling original NOS parts. But more and more reproductions. So I will double and triple check before buying there. Damn, you're right about the German text! Missed that completely. That's pretty evil, falsifying MB tags. A new low. But, their German isn't that good, almost very poor. I would expect they bought it like this, missing it themselves -in this case. Should this not be forwarded to Mercedes, that’s gaining quite a large profit form forged goods. Probably. I mean, Mercedes Shop Forum was forced to change their name to PeachParts Shop Forum because it couldn't include the word "Mercedes" in it. I think Mercedessource got off the hook because it's one word, and they are quick to correct you if you write it as "Mercedes Source". So back on track, anywhere else we can get a set reliably without costing the earth? I'll do some searches in German, Dutch and French over the weekend. Maybe you try English Google in the meantime? Cool time to learn German haha.